Cal Ripken Jr.’s playing career is best remembered for being baseball’s Iron Man, never missing a game for 17 years. His career after baseball has been built on furthering a love for the game. On Wednesday afternoon, Ripken along with hundreds of students, faculty and alumni gathered at the newly renovated Southeast High School Sports Complex for its grand unveiling. 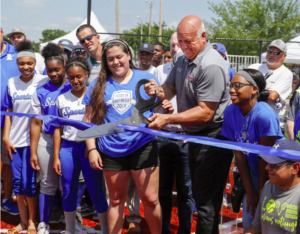 In partnership with Fields & Futures, the Cal Ripken Sr. Foundation and Oklahoma City Public School Athletics, the new field and electronic scoreboard for baseball and softball were unveiled to the public. Southeast became the 22nd OKCPS athletic field to be renovated, and became the first to feature a synthetic turf infield. Ripken said it was important to him and his family foundation to partner with Fields & Future because its mission of restoring baseball to poorer schools and neighborhoods. It is a mission his father Cal Ripken Sr. would have been all about. “My dad was a magician at getting kids involved and getting them to look at their potential,” Ripken Jr. said of his father, who passed away 1999. “I think we all understand the power of sport and how sport teaches us a lot of lessons.